The throw-away ethic has become so engrained in our society that it has virtually eliminated the concept of maintenance. Indeed we are consumers, and so we consume as if it were the most natural of habits. At one time, there were business formulas that were founded on various types of maintenance: the house painter, the corner garage auto mechanic, or the television repairman. Society’s failure to sustain a culture of maintenance has resulted in a frail and underdeveloped industry. The maintenance industry, as it turns out, was a wonderful contributor to the local economy – keeping local dollars circulating locally. Maintenance, as it relates to heritage buildings is a concern for preservationists and those who own historic properties. Unfortunately, the present reality is doubly challenging for home owners and carpenters because one or both parties often do not understand the concepts of in-kind replacement, honesty of materials, historic scale and proportion and heritage millwork. It may be interesting to look back at a snapshot of what a healthy maintenance industry once looked like. Consider for a moment how traditional tradesmen marketed their skills. It was really quite simple. They identified a niche market, staked their territory, and educated prospective clients as to what they offered. The advertisement below is from 1903 and illustrates well the idea of creating a niche market. Mr. Grant, though skilled in general carpenter work, stressed his particular proficiency with respect to bay windows and verandahs – two of the most common building additions of his time. No one advertises this sort of skill today – yet the work and need is there – not so much for bay windows but certainly for wooden windows in general and especially verandahs. 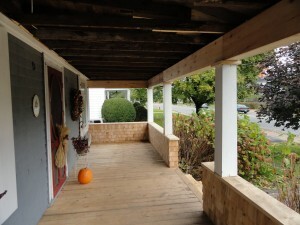 Large numbers of heritage verandahs are in a wanting condition and require appropriate maintenance or complete rebuilds as was the case with this Craftsman style verandah below. Verandahs are just one example, though, of the many skilled trade opportunities that exist in the historic preservation field as long as we believe in the value of maintenance and encourage young people to enter these trades. The great challenge for those entering such trades though is that they need more than just the obvious skill set – they must also be able to foster re-creation of that maintenance culture – a culture that will protect original architectural details and components from replacement by poor imposters that are not only questionable in composition and scale but are often not produced locally. How many beautiful homes have lost their dignity with the installation of pressure treated toothpicks? How many wooden windows have been replaced with vinyl ones because no one bothered to do the math on the energy efficiency payback? – Often in the 80 to 150 year range even without any intervention to improve the outgoing wooden counterparts. We all need to retrain ourselves so that we do not automatically assume new is better. Sure, “new” has its lustre but it’s incredibly fleeting as there is always something newer. Things that have gathered around themselves the charm of antiquity boast an enduring appeal. Regular maintenance is almost always cheaper and often more aesthetically pleasing. As well as being a cornerstone of historic preservation, maintenance is an important contributor to a few little things known as environmental stewardship, sustainability and local economic stimulus. The familiar matter of heritage preservation versus development in downtown Halifax is scheduled to fall into the laps of regional councillors Tuesday. This quote is the opening line of an article penned by city hall reporter, Michael Lightstone in the October 2nd 2011 edition of Halifax’s Chronicle Herald. I want to draw attention to it in order to highlight a common mischaracterization of preservation. Preservation is not the alternative to development as the quote implies. There is no “either/or” choice. Preservation is economic development or at the very least it is a tool for economic development. Historic preservation is not about saving an old building simply because it’s old. It is about smart, sustainable economics and it is about respect for one’s culture, heritage and environment – all of which have strong economic significance. New developments create excitement often at the expense of previous developments, reinforcing the artificial and irrational need of consumers to trend toward newness. The one economic guaranty of “newness” is that there will always be something newer. Historic preservation does not place stock in such fleeting appeal. The appeal of historic preservation is tied to the aesthetics of period architecture and the enduring connection with community heritage – people have lived and worked in these buildings since before living memory and we as a society have attachments to those same buildings as a result. Those societal attachments impact our sense of place, continuity and even who we are. Competitive Advantage - Businesses strive to differentiate their products from those of competitors through developing competitive advantages. Products that possess real or perceived competitive advantages stand out, seize market share, and are able to command a premium. Communities follow that same model in their attempt to attract investment of people and capital. Perhaps the best way in which a community can express its competitive advantage is through the built environment – a reflection of its culture and heritage. It is often said that knowledge sector jobs can be located anywhere. If a community looks like it could be anyplace it possesses no aesthetic competitive advantage with which to hold or attract talent. Tourism Resource – Tourists, whether they are day trippers or globetrotters seek out unique places and experiences. All round the world, historic streetscapes provide the requisite backdrop and infrastructure for successful tourist destinations. It makes no great difference whether they are splendidly ornate or humbly vernacular so long as they convey a sense of place and contribute to an authentic local experience. Buy Local Support – Historic preservation is naturally conducive to any buy local strategy. Adaptive reuse of an historic building supports the local economy to a greater extent than does a new construction project of the same value. A renovation is generally labour intensive, requiring local tradesmen whose earnings tend to cycle through the community. New construction is generally materials intensive, requiring the importation of goods that cause money to flow out of the community. Local and sustainable development is also a smart insulator in challenging economic times. Main Street Retail Authenticity – Downtown commercial districts are generally (hopefully) comprised of older buildings that feature a high percentage of locally owned businesses. Such businesses, in the form of boutiques or services, tend to contribute to local culture in a more genuine way than do the shops in suburban malls. The authenticity of the downtown merchant is heightened by historic commercial buildings that speak of a local shopping continuity spanning generations. Business Incubation – Historic commercial districts often exhibit a mix of entrenched family businesses and new fledgling ventures. The affordable rental spaces often associated with historic commercial districts serve as incubators for the ideas of entrepreneurs – many of whom are young visionaries who, succeed or fail, need a venue in which to roll the dice. The opportunity for small business incubation fosters entrepreneurship and contributes to the retention of young adults and nourishes their hopes and aspirations. Every community has its own examples of past choices made between historic preservation and economic development. Choices for the former have never precipitated economic decline and generally stimulate renewal. Municipal leaders and developers who capitalize on the promise of historic preservation will not be making the choice between preservation or development but seizing upon a strategy that marries all the comprehensive concerns of citizens: cultural, environmental, social, and economic.